Digging into the exact ports that were showing dropped packets resulted in nothing. The VMs connected to these ports were not registering any packet drops. Odd. It took a while before any info came out but it apparently was a bug in the 6.0 code. I started following this thread on the VMware community boards and found that I was not alone in seeing this error. In our environment the error was also only present when logging in as the admin user. vCenter admin users were not seeing it so this pointed towards a cosmetic bug. A KB article was released about the bug and that the alert can be disabled but it does not described exactly how to disable the alert. The alert is disabled by default in the 6.0.1 release but if you installed 6.0 and upgraded to 6.0.1 and did not reset all settings (as I did not do) there error is still there. On the Policy Editor click the 5. step – Override Alert / Symptom Definitions. 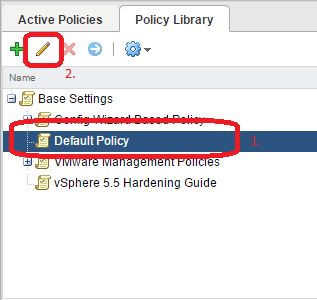 In Alert Definitions click the drop-down next to Object Type, fold out vCenter Adapter and click vSphere Distributed Port Group. To alerts will now show. Next to the “One or more ports are experiencing…” alert click the error by State and select Local with the red circle with a cross as show below. I had a few issues with clicking Save after this. Do not know exactly what fixed it but I had just logged in as admin when it worked. This disables the alert! Easy.